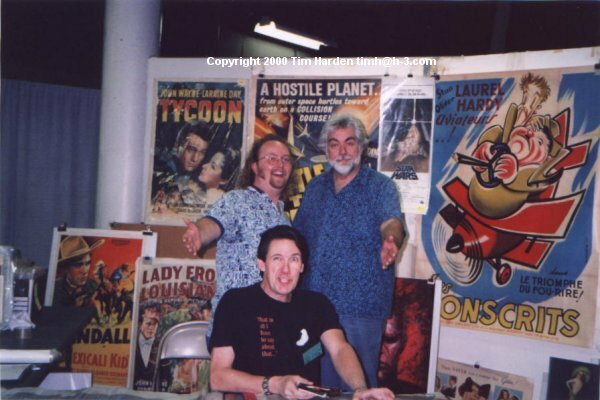 This picture and the others with Ed Neal were taken late last year at a collectors convention here in Austin, TX. Gunnar, my wife and I drove to Palmer Auditorium and found Ed at his booth selling rare posters. To support Ed, I bought the white TCM poster (reproduction of the original by New Line Cinema) and had both Gunnar and Ed sign it. Later, when Gunnar, Allen Danziger and I went to Kingsland for dinner, I had Allen sign the poster as well. Ed was very nice, personable and funny! Since we showed up as a surprise to Ed, Ed started introducing Gunnar to other spectators and shoppers. Eventually, people started buying TCM posters and having them sign it. At least one other person had the Headliners Leatherface figure and had Gunnar sign it. It was fun to meet Ed and I appreciated him signing all the materials I had for him. I hope to meet him again.